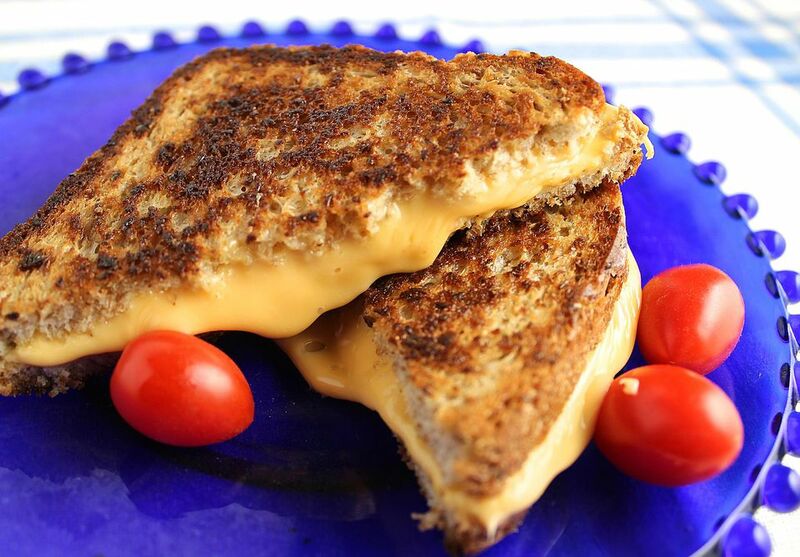 Believe it or not, this recipe for My Favorite Grilled Cheese Sandwich took some experimentation before it achieved perfection. I tried spreading butter on the inside, different types of cheese, and different ways to grill it. This is the best. You have to use the presliced American cheese wrapped in plastic wrap, and whole wheat sandwich bread, along with real butter, in this recipe. This isn't a gourmet recipe, but it's fabulous. I recently discovered white American cheese in the deli department of my supermarket. If you avoid processed cheese because of the added color, this product is a great solution. Serve this perfect sandwich with some baby carrots and some grape tomatoes or a green salad. That's really add you need for a fabulous lunch, along with some iced tea or sparkling water. Place two of the bread slices on the work surface. Top each with 2 1/2 slices of the American cheese. Top with the remaining bread slices to make sandwiches. Spread the outsides of the sandwiches thinly with butter. Heat a nonstick skillet or griddle over medium-low heat. Place sandwiches on the skillet and cover with a pan lid. It's important to cover the sandwiches as they cook so the cheese melts in the time it takes the bread to brown. Cook for two to three minutes or until the bread is golden brown on the first side. Carefully flip the sandwiches using a large spatula, cover again, and cook for two to three minutes on the second side until the cheese melts and the bread is nicely browned and crisp.